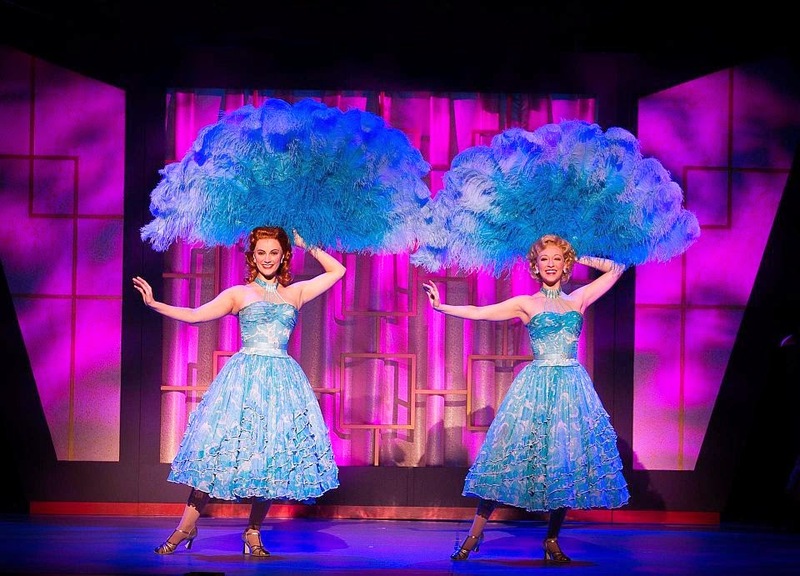 The stage adaptation of Irving Berlin’s 1954 movie musical White Christmas toured the country for a couple of seasons before opening for a limited Broadway run in 2006. I caught it in Boston nine years ago and found it so satisfying that, when it came through again this Christmas, I went back for a second look. The original production carried a directing credit to Walter Bobbie, with Randy Skinner listed as choreographer; Skinner is now listed as director, too, but the show is almost exactly the one I remembered. Part of the reason I checked in with the musical again was my disappointment at the Goodspeed’s attempt to do something similar with Berlin’s other Christmas perennial, Holiday Inn. (The song “White Christmas” was written for Holiday Inn and won the 1942 Academy Award, though most people associate it with the later picture.) To be fair to Gordon Greenberg and Chad Hodge, who adapted Holiday Inn (Greenberg also directed it), the source material, though perfectly adequate for one of the tossed-off musicals Paramount specialized in during the thirties and forties, is awfully thin for the stage. 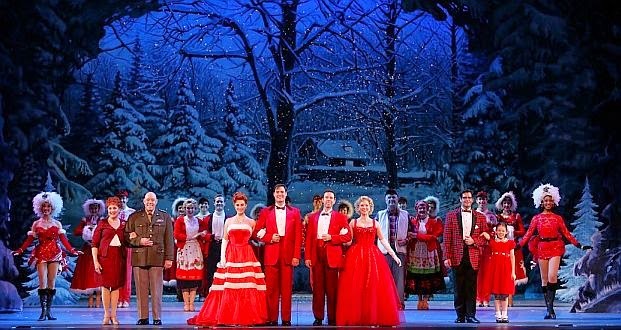 White Christmas, by contrast, was overstuffed as a movie and distinctly on the sappy side, but it has just about the right weight for a musical evening in the theatre. And David Ives and Paul Blake, who wrote the playscript, have dried it out a little. The plot about the song-and-dance men, Bob and Phil, who discover the general they served under in World War II moldering away as the proprietor of a nearly bankrupt Vermont inn and conspire to rescue it – and him – doesn’t strong-arm you the way it does in Michael Curtiz’s movie. It certainly helps that this time around the role of the retired general is played by Conrad John Schuck, who, as just plain John Schuck, appeared in a handful of Robert Altman’s best early movies, M*A*S*H (as Painless, the dentist), McCabe& Mrs. Miller and Thieves Like Us. (As Chicamaw, the embittered, alcoholic bank robber in the last of these, Schuck gave one of the most staggering displays of character acting on record, though he has yet to receive the recognition for it.) Recently and unexpectedly, Schuck has made a career out of appearing in musical revivals; he was Daddy Warbucks in one Annie revival, and I’ve seen him in productions of My Fair Lady and Juno, the too-little-known musical of Sean O’Casey’s Juno and the Paycock. In White Christmas, in the role created on screen by Dean Jagger, he doesn’t get much to do until the end, when he walks out on stage the night of the revue Bob (James Clow) and Phil (Jeremy Benton) have cooked up to draw crowds to his inn and discovers dozens of veterans from his unit sitting in the audience. The speech he gives them is a stock piece of writing, but Schuck delivers it with a perfectly calibrated balance of modest understatement and whole-hearted emotion. (It’s the way Berlin uses the winter/snow motif from “Snow” and “White Christmas” for the opposite effect, to suggest a romantic freeze-out, that gets to me.) Moldovan is more than up to the challenge of standing in for the ineffable Clooney – plus she’s a better actress. It’s a backstage-musical number – Betty sings it at a Manhattan nightclub – with a dramatic context: Betty has run away from Bob due to a misunderstanding, and he’s chased her down here. The stage version gives Bob an answering song, “How Deep Is the Ocean,” a Depression-era Berlin gem that might be the most haunting melody he ever concocted. As performed by Moldovan and Clow, this medley is, as intended, the emotional high point of the show.